But an empty bed at the beginning of your planting season can be a real challenge. An empty backyard where the bed is yet to be - even more so. Why? Well, flower beds are not so easy to plan and build. An image you have in your mind can be drastically different from what you will end up with after digging and planting - especially if you are inexperienced. Personally, it took years before my flower bed started to look like more than just a bunch of pretty flowers that randomly grow on the same patch. Fortunately, these days you have plenty of resources like this one to inspire you and help you find something that suits your taste. Before diving into the imaginative world of classic flower beds, let’s learn something about bed edging - a very important element of any flower bed design. 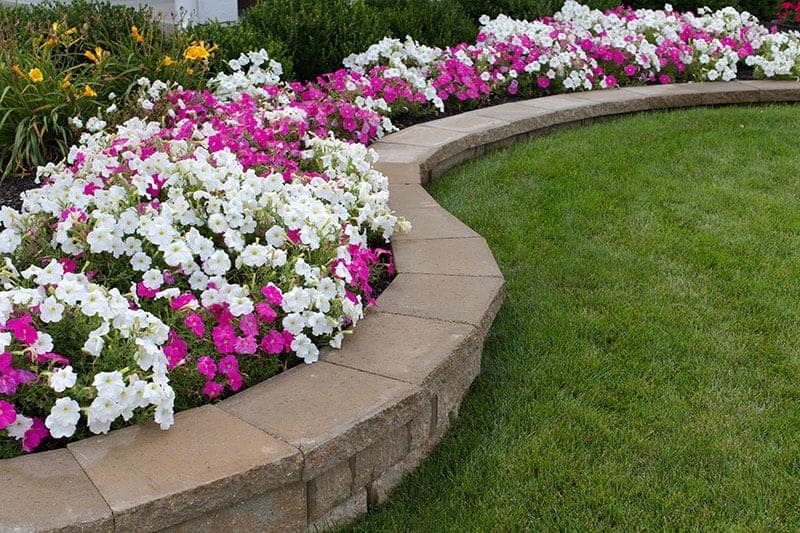 A flower bed edge will define the look of your flower bed almost as much as vegetation it will contain. 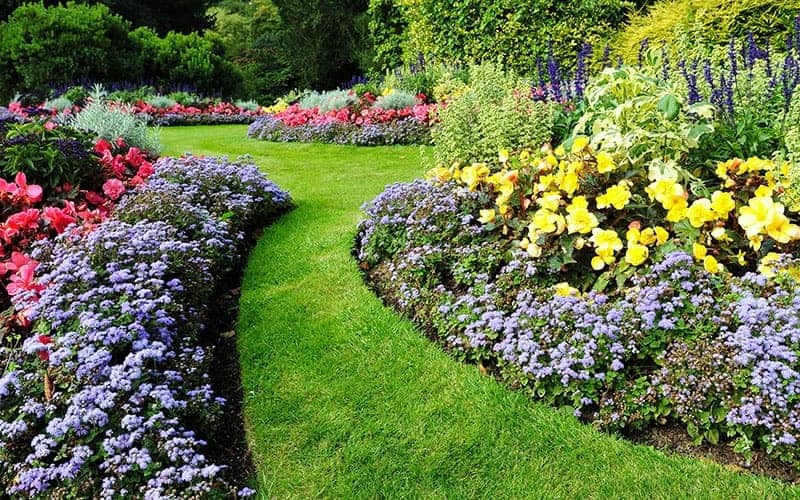 The shape of your garden could also depend on the edging style, and vice versa. That is why it is important to consider all options that are available. Here are some of the most common ones. Because the flower bed plant community stands out so much from what surrounds them, whether its grass, concrete or gravel, actually building an edge is not mandatory. The flower bed creates its own natural edge. Even if some plant overflows its bed - it can look charming. However, having no edge can create some issues, e.g. tricky mowing. Also, an edge is something that can give an additional appeal, so consider the following ways of creating it. One of the typical ways to edge a bed is by using a flower bed border fence. They are used for edging typical rectangular or square flower beds, for example along garden pathways or against a building wall. Curves and wavy patterns are hard to achieve when using fences. Fences are usually made out of wood, plastic or wire. In my opinion, wooden ones look best out of the three, and that goes for any bed design. You can buy a bed fence in garden centers, but with some effort (and tools), you can make it yourself. 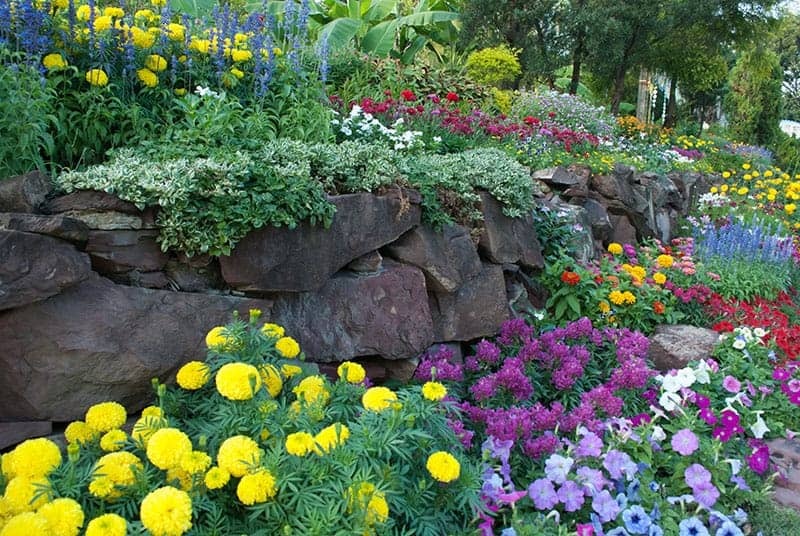 Edging a garden bed with stones is a classic option that will add diversity and texture to your flower bed. Additionally, warmth-loving plants will benefit from stone structures, as they retain the sun’s heat. Also, small lizards will highly appreciate it. Edging with bricks or concrete elements falls into the same category. This tutorial uses bricks to create a warm, rustic bed edge. Although flower beds are often edged with hard materials (e.g., bricks, stones, fences), it doesn’t have to be like that. You can use vegetation as well. You can use different plants, but low shrubs are suitable for this purpose - especially because they will last many years. Another advantage of using plants as green edges is that they can easily and naturally follow non-linear edge patterns. This particular bed is wavy with deep curves, adding more dynamics to the entire design. Beds that are edged with one flowering species are really attractive, especially if you manage to create a slope like this one. Go for inexpensive, densely growing, productive flowering plants such as marigolds, begonias, asters or chrysanthemums. They should be hardy enough to take “life on the edge” well. 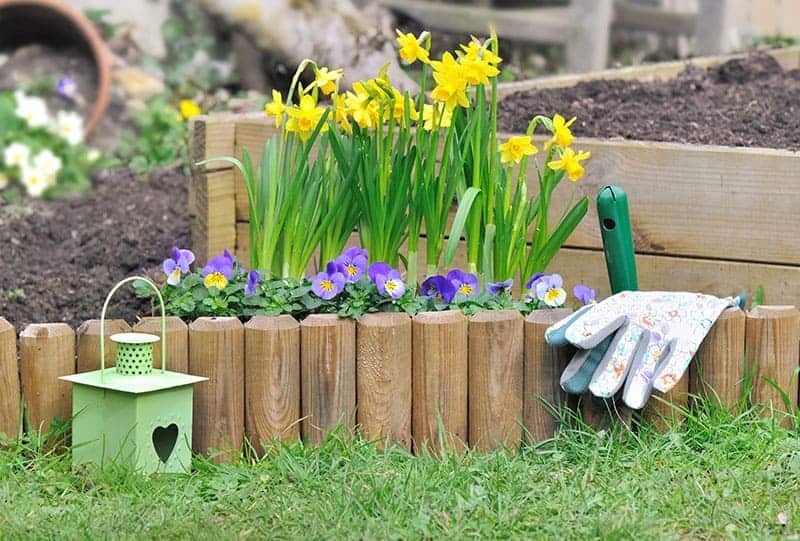 A cool thing about flower beds is that you can make them anywhere where you are allowed to dig and where the soil allows - in your front yard, in your backyard, along with your fence or your driveway, around any garden feature, or in the middle of your lawn. 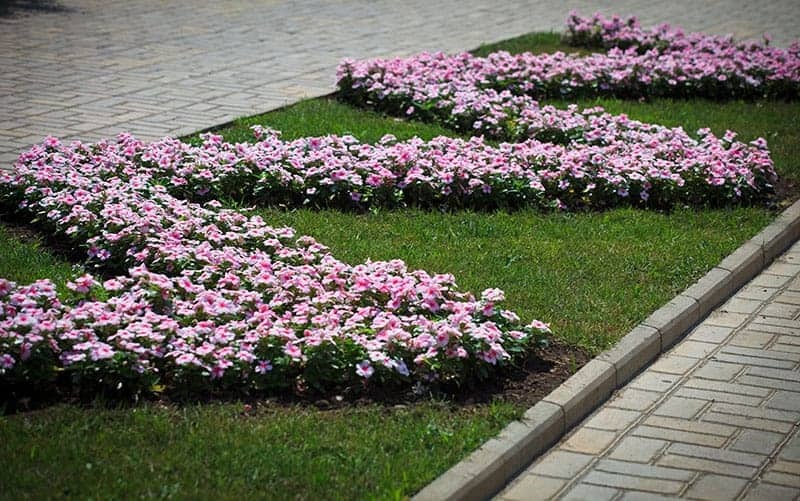 Besides looking gorgeous themselves, flower beds can influence and change the entire look and feel of your yard, thereby becoming a true landscaping element. You will see what I mean in some of the examples below. To a human eye, symmetry is captivating. A circle often considered a “perfect shape”. 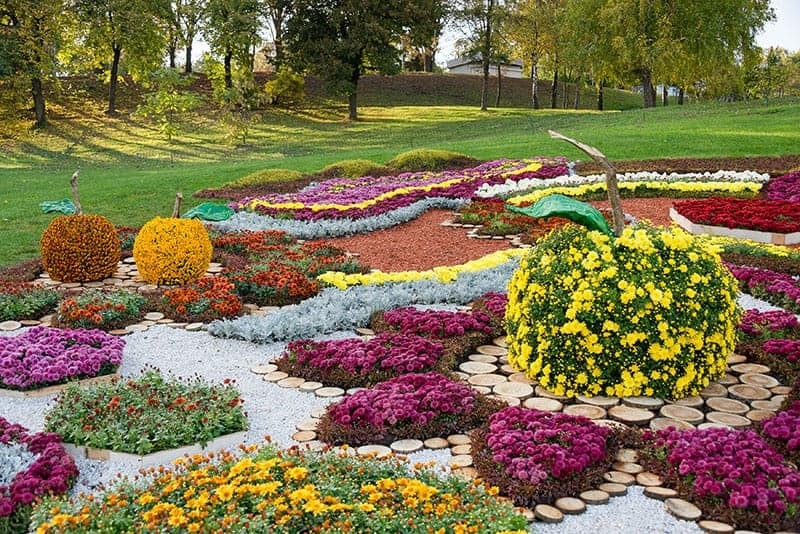 That is probably the reason why circular or oval flower beds are so popular. They look especially striking when placed in the middle of a well-maintained lawn. 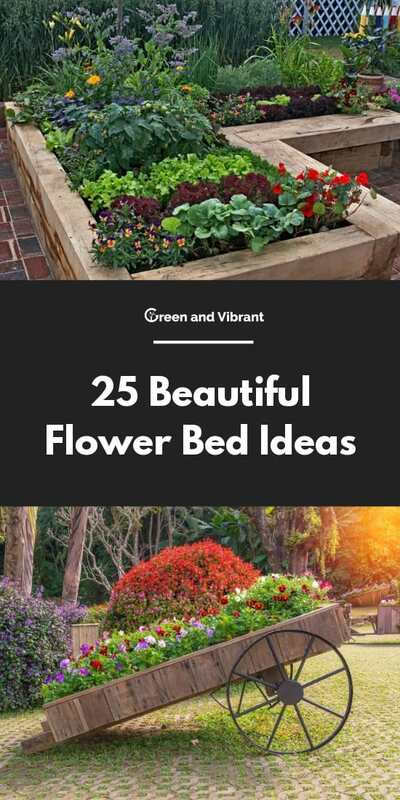 The flowers inside a round bed can be a single, color, a random mix of two or more colors, or in several colors which follow the round pattern, which can be a little challenging to achieve. 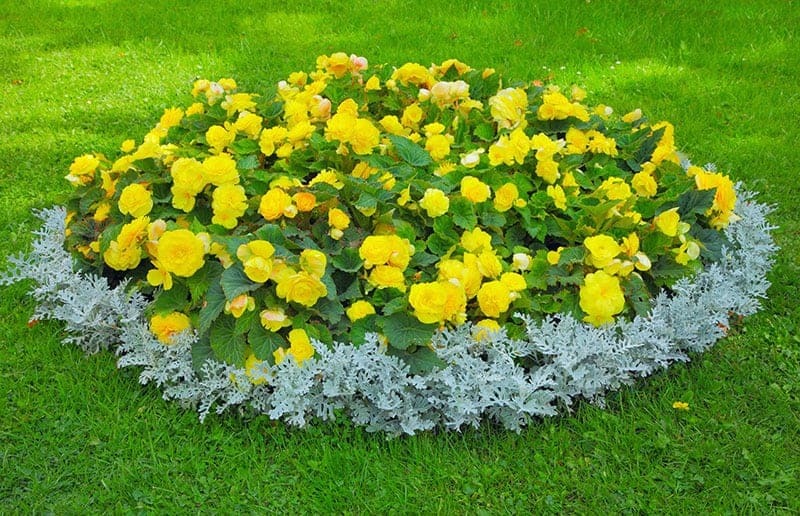 To find out how to create a perfectly round flower bed, go here. In spite of our last example being a classic, flower beds do not have to follow a circular or oval pattern. If you are bored with standard approaches, you could try some unusual geometry. This zig-zag flower pattern is simple to achieve, yet it’s visually very effective. When striving for geometry, you should create edges of your desired on the ground out of sticks or tape. Then plant carefully within the borders of your pattern. Vibrantly green lawns can be a real joy. However, if you’re a flower person, they can be a bit dull and lifeless. 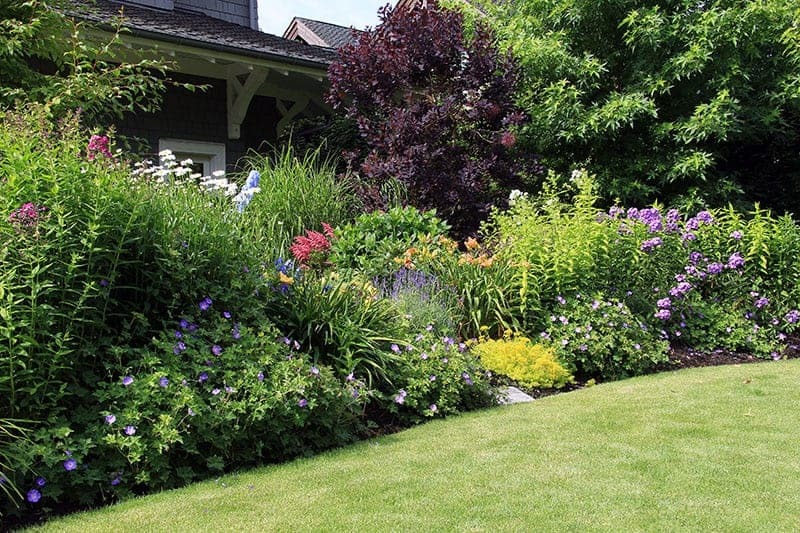 As an alternative, check out this garden where flower beds have taken over the lawn completely. The large nonlinear beds have reduced the lawn to a mere pathway, which meanders between them like a river. It is exactly the complementary irregular shape of the beds which enable the green path to have such a natural looking “flow”. If you are considering this design, make sure that the lawn grass you are using is the kind can withstand heavy foot traffic. This design takes us a step further. 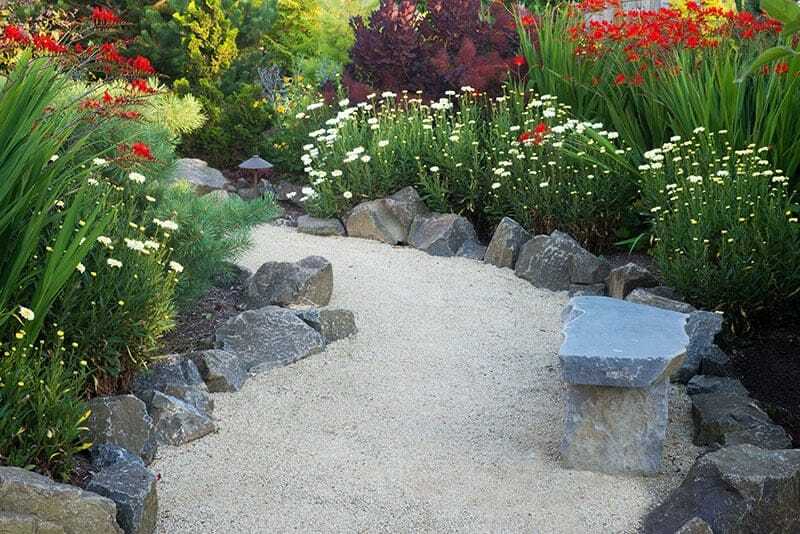 This bold garden has asymmetrical beds, with a curved gravel path which is meandering between them. 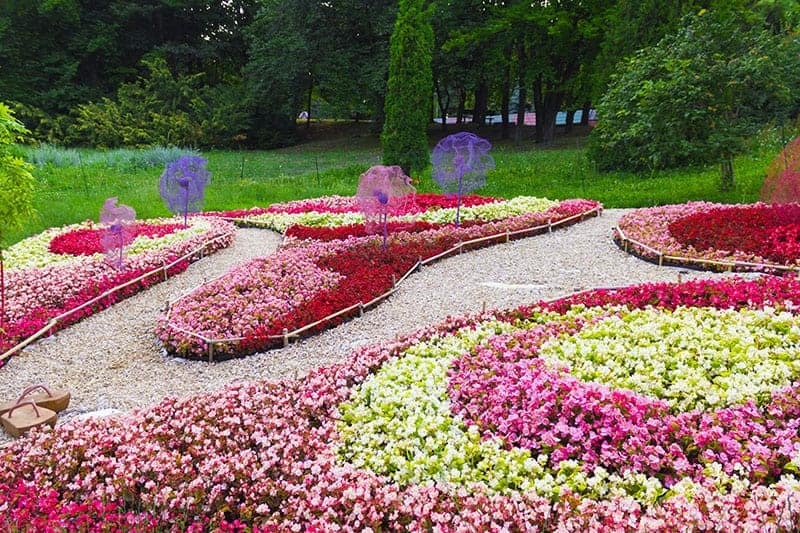 The flowers are planted in independent wavy or rounded patterns of single colors. All these curves and colors together create a mellow, almost psychedelic effect. Here is something for the truly artistically inclined gardeners. Creating complex shapes in flower beds is a real landscaping challenge guaranteed to attract a lot of attention. A design like this requires a lot of drawing, pre-planning, and measuring - it is not something that can just be done right on the spot. If you want to recreate the natural look, following the natural ecosystem’s law of layers is a perfect way to go. In natural ecosystems, plants form guilds according to their height. 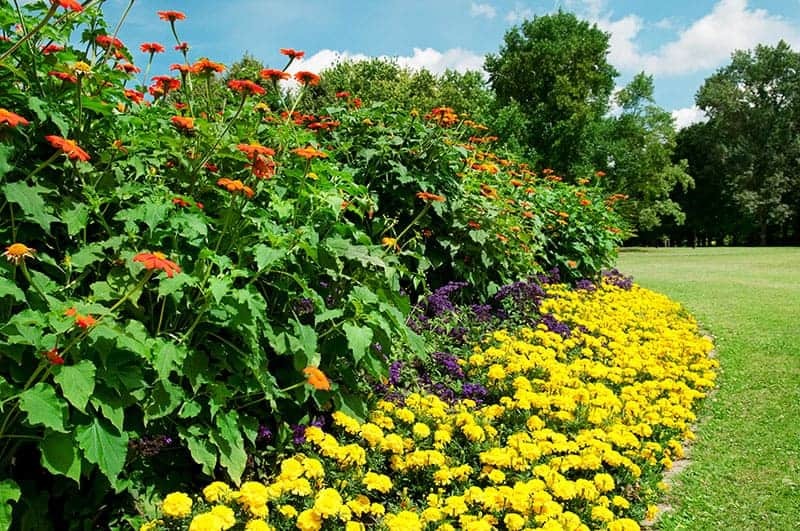 This flower bed uses tall perennials (including trees) and lower annuals and perennials to create guilds, resulting in a lush slope of garden plants. 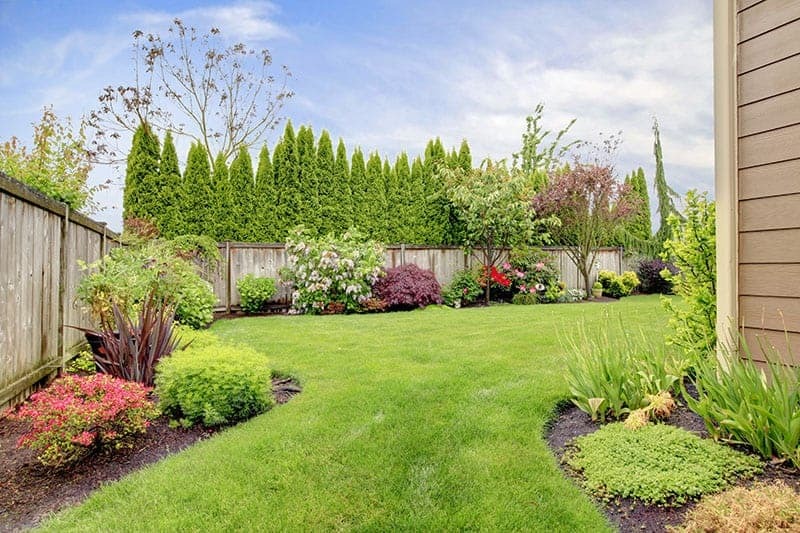 Flower beds in front of walls and tall fences add depth and liveliness to the limited space. A well-planned bed can create an illusion that your garden is bigger and spacer than it actually is. Therefore this is an ideal option for fenced yards that give off a “square” impression. One of the best views you can design yourself is to create a rich flower bed right under your window. It will bring color and fragrance into your room(s), plus you can watch your garden in all weather conditions form the coziness of your home. You can use taller plants such as these sunflowers to create shade where you need it - especially if your windows are facing south. Using native wildflowers and pollinator-friendly plants will be an additional treat. Besides beautiful flowers, you will have fun with watching bees and butterflies. 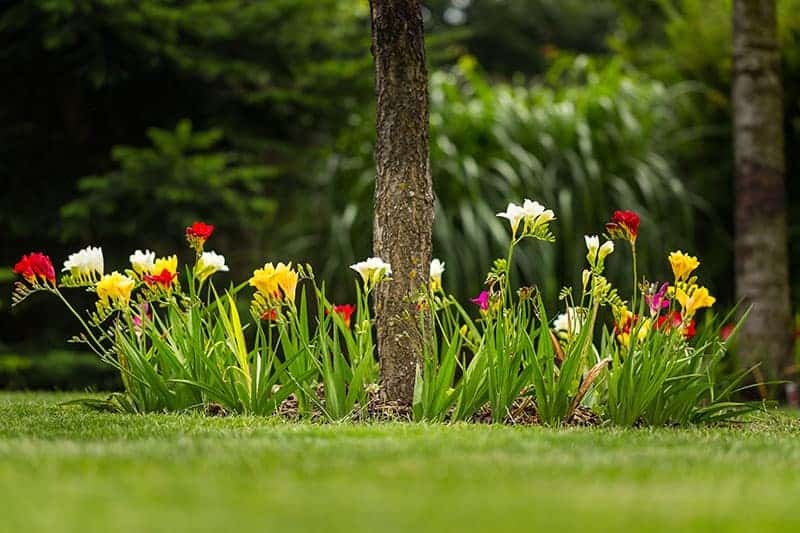 A perfect way to make deciduous trees “alive” early in the year is by creating a flower bed and planting early spring species such as daffodil and crocus around it. 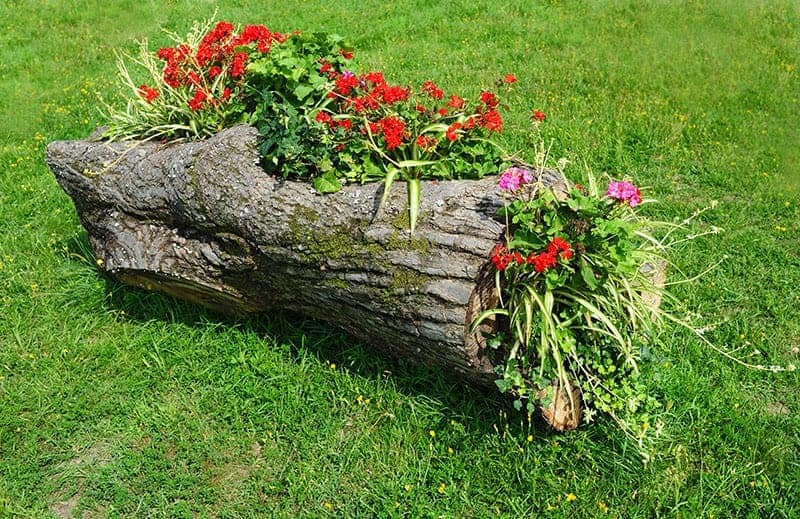 Depending on the chosen flowers, the tree mulch can benefit both flowers and the tree. These freesias seem to be enjoying it, and the weed problem is solved. 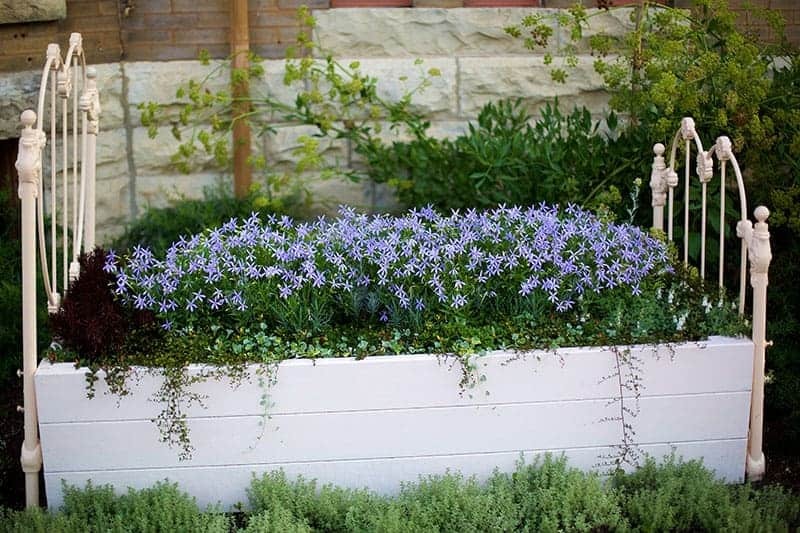 Raised beds come as a rescue in situations where you can’t plant directly in the soil. This includes balconies, concrete surfaces, but also situations where it is not advisable to dig - like living in a rented home, or when the soil is contaminated or not suitable for what you intend to plant. 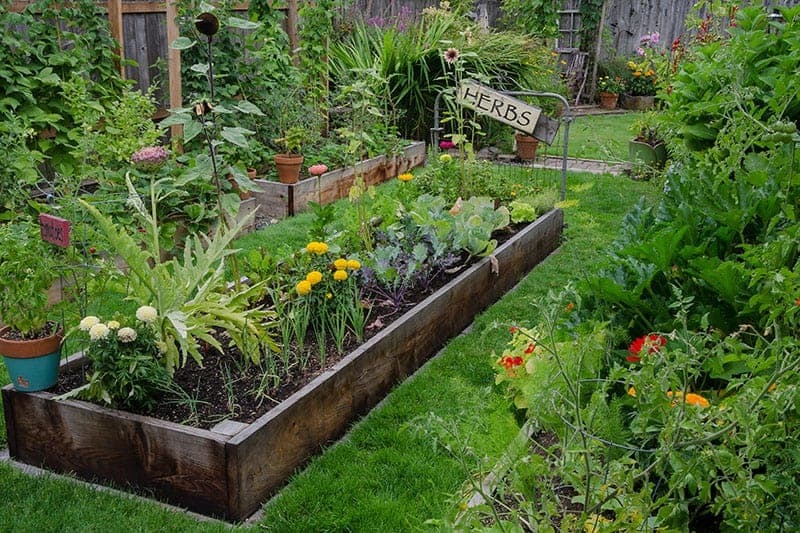 Besides utility, raised beds can be a great decoration themselves. Let’s check out some classic and some unusual raised bed options. Here is a typical low-lying wooden raised bed. It is made out of plain wooden boards. Beds like these are easy to construct and are used to grow everything from flowers to vegetables. If you are not lining your wooden bed with a pond liner, know that the wood will rot in time. All in all - it is not long-lasting, unlike the next example. Still, seasoned, weathered boards can add to the charm of a rustic garden. Masonry raised beds are a true classic. From public squares to private backyards, they really enrich the space by adding volume, texture and sometimes even resting spots. In short - a stone raised bed is more than just a planting bed. Besides its primary function, this raised bed has another important purpose - it edges the lawn in a very elegant way. In the previous example, the stone wall was used as a regular bed edge. However, in this example a similar structure is embedded within the bed itself, creating a dramatic terrace effect. It reminds of rocky mountain slopes, so you can choose the plants accordingly. As previously said, the ability of the stone to hold the sun’s heat will benefit the warmth-loving plants. 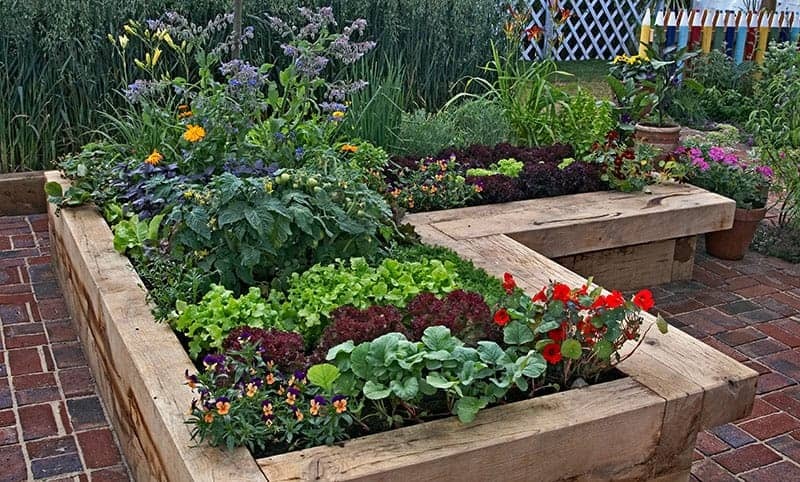 This raised bed is made from thick wooden beams - therefore, a design like this enables you to upcycle construction material. The L-shape makes the bed suitable for different spaces, and broad wood gives a nice surface to sit on and rest while enjoying the view of your garden. Wooden beams are also more durable than most other wooden materials. However, since they are often chemically treated, using a durable plastic liner in the bed is a must, especially if you are planning to grow edible or medicinal plants. Another L-shaped design successfully uses the corner of this balcony, creating more space for planting in a limited area. It is made out of panels (different sorts of panels will work), with metal profiles added for additional sturdiness. 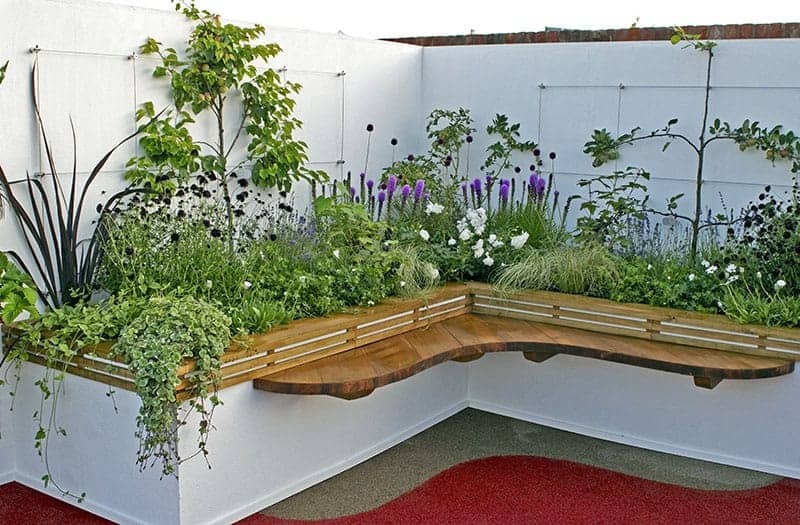 This sturdiness is needed considering that this raised bed features an elegant wooden bench nested inside the “letter L”. Old trolleys are like raised beds on wheels. Their entire look makes them very attractive addition to any garden. In some situation, you and your flowers may benefit from having a taller bed - for example, if you have a dog that likes to dig and can’t help it. There is one major drawback. If you don’t already own one, trolleys might be pricey and hard to find. And if you are a proud owner, you may be reluctant to use your cart as a flower bed since in time it will succumb to moisture and rot. Here is a true flower bed! Parts of an old metal bed frame were added to the matching white wooden bed, creating a real bed for the flowers. Note that some people use full vintage beds for this purpose. Flowers in pastel colors such as pink and lilac, as well as plants with silvery leaves (think lavender or lamb’s ear) would complement this design nicely. This bed is made out of a real raw piece of wood. No boards, no screws - the bed is simply carved out of a tree trunk. The larger the trunk - larger the bed. One downside of this bed is that the wood will eventually rot - it is not a lasting option. Still, if you like simple solutions in tune with nature, it is worth considering. Old tires are probably the most common item upcycled as a raised bed. That is because of their availability, and also the fact they a big environmental problem, so they are worth upcycling. My example here is straightforward and raw-looking, but tires are often painted in vivid colors and used in charming “recycled” setups. 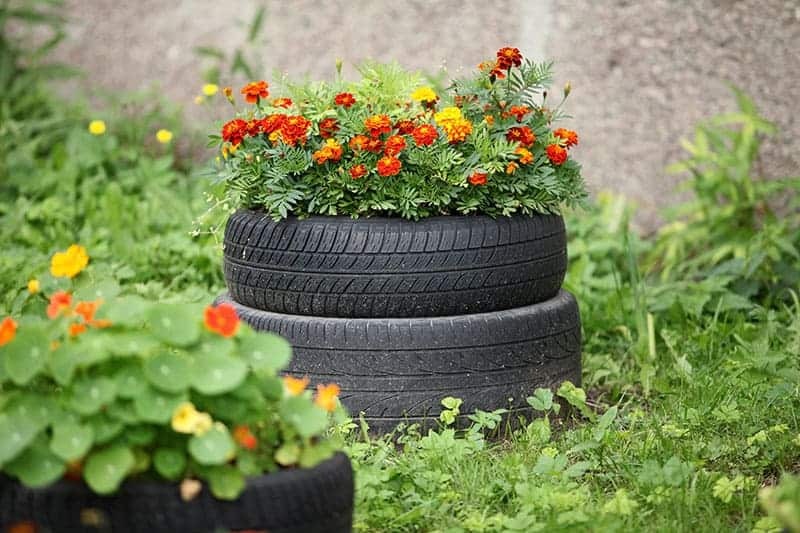 A word of caution: I wouldn’t recommend tires to grow edible plants, as they may leach some of the many chemical components automobile tires are notorious for. 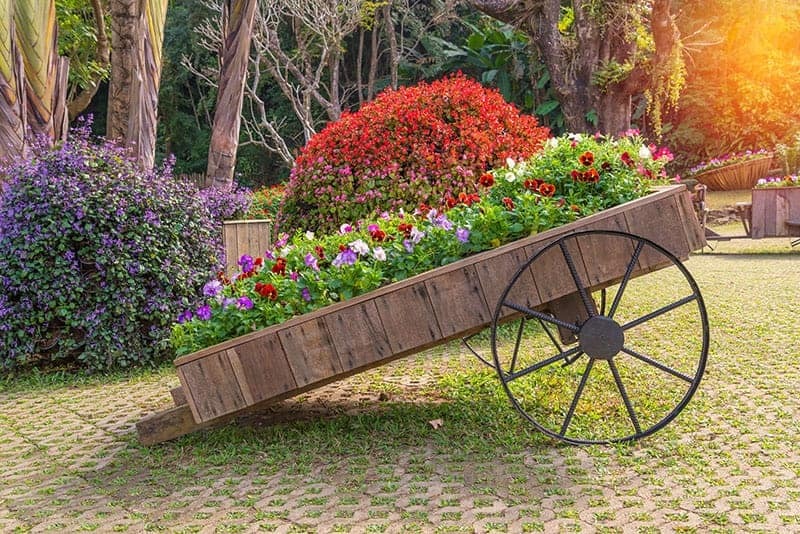 Wheelbarrows are our trusty allies in gardening, so why not upgraing one at the end of its lifetime to serve as a flower bed? 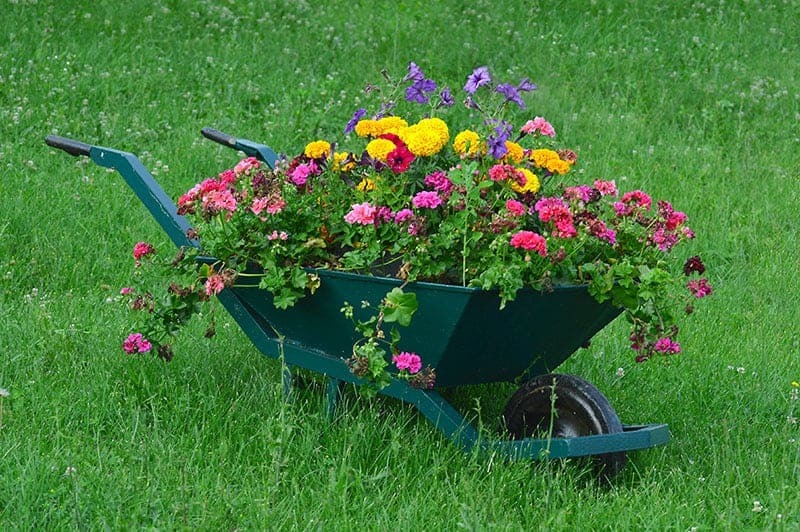 A wheelbarrow bed would look good placed next to another larger, ground-level wild-type flower bed. Although most beds shown here are “lonely”, don’t forget that flower beds are perfect spot to place your garden furniture next to. 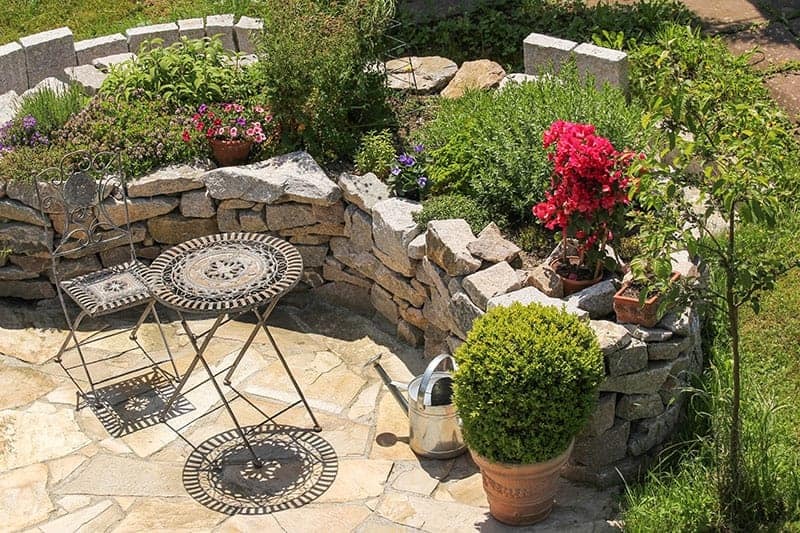 This stone pavement combined with stone raised bed and stylish metal furniture evokes the sense of Mediterranean. A perfect place to start your day with a coffee if your garden is facing east, or to have an afternoon drink if it’s facing west. Just be careful - if you are facing south and experience full sunshine throughout the day - this setup can definitely get too hot. Because they are the essence of every garden, flower beds are worth investing in. I’m not talking (only) about finances, but primarily about time - for research, planning, and building. If this feels overwhelming, just remember that you will be richly rewarded by all the botanical beauty that your ideal flower bed will bring you for many years. 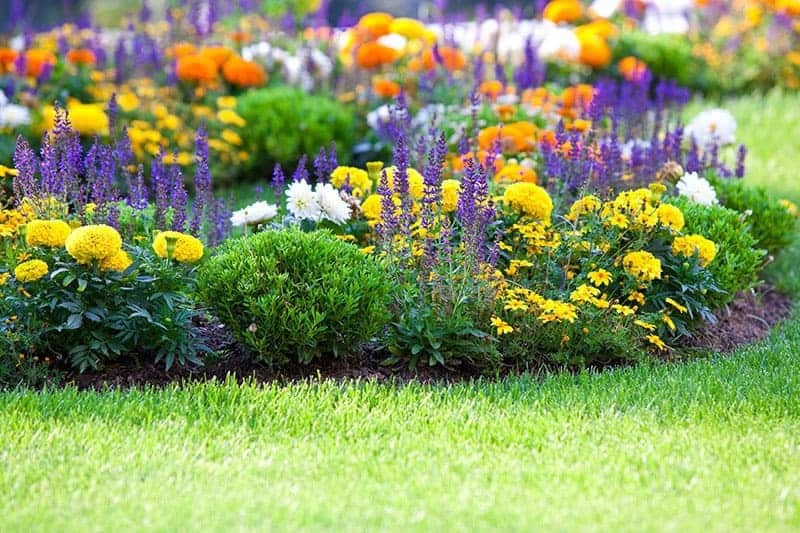 What types of flower beds look best to you? Are you a fan of geometry or are into wild style? Feel free to drop a comment and let the world know!